NEW LONDON, Conn. -- Tufts University (11-3, 7-2 NESCAC) defeated Connecticut College (5-8-1, 2-6-1), 3-2, in the regular-season finale for both clubs on Harkness Green Saturday. The teams will meet again tomorrow as the Jumbos locked up the #2 seed in the 2007 NESCAC Championship Tournament and will host #7 Connecticut College for a noon-time match up in Medford at Kraft Field on Sunday. 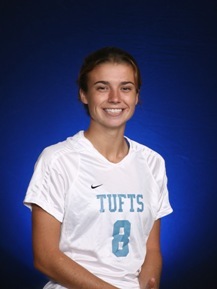 Sophomore sensation Cara Cadigan (Nahant, MA) tallied a goal and an assist to lead the Jumbos on Saturday. Claire Linden (Bethesda, Md.) and Jackie Wade (Medfield, Mass.) contributed scores for the hosts. The Jumbos carried a 2-1 lead into the half on the strength of goals by Ali Maxwell (Exeter, NH) in the 21st minute and by Fanna Gamal (Albany, CA) in the 37th minute. A goal by Connecticut College's Claire Linden had tied it up briefly at 1-1. In the second stanza, the visitors got an insurance goal in the 56th minute of play. Cadigan collected her own rebound off the post and put it in to make it a 3-1 score. The goal was the 14th of the season for Cadigan, tying her for second place on the team's all-time single-season list. She also moved into second place on the team's single-season points scored list with 33. Connecticut College made it interesting with exactly nine minutes on the clock, as Wade countered with a score that cut the lead to one. But the Jumbos were able to hold on for the victory. Sophomore keeper Kate Minnehan (Hopkinton, NH) had five saves for the Jumbos. Camels sophomore Bailey Andrews (Pembroke, MA) had four saves and Jenna Ross (Longmeadow, MA) added seven stops in relief duty.